For the bulk of enterprise data, the answer for cost-effective data storage is not always high-performance primary storage, meant for real-time applications, but rather a more-than-adequate-performance afforded by object-based storage. If you're involved with enterprise storage, even on the periphery, you've probably heard someone talk about Object Storage. If you feel you don't actually know what object storage is, what the buzz is all about and if, and where, it would be appropriate to deploy in your organization - you're not alone. 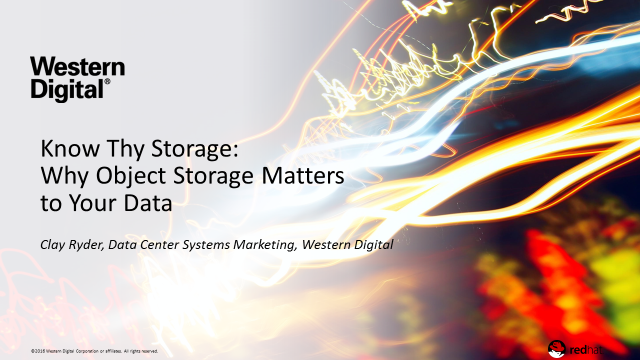 Join us to learn why object storage matters, the limitations it solves within the data center, why it's become so prevalent in the age of Big Data, and how customers are using object storage today.